Leaving Russia without visiting another of the famous Golden Ring cities was not an option. We planned on visiting Sergiev Posad, but we wanted to squeeze in a second destination, so Rostov Veliky popped in. And that was a huuuuge surprise. Sergiev Posad has one of the nicest monasteries in the whole of Russia, but it is overly touristic. Dozens of buses arrive there from Moscow and spend the afternoon around the monastery. But in the evening when they are gone it’s only you and the locals at the evening mass. Happy Frog didn’t spend one, but two nights soaking up the atmosphere and loving the place. Trinity Lavra of St. Sergius, Sergiev Posad’s monastery is like the Vatican of the Russian Orthodox Church. 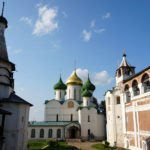 The biggest monastery in Russia dates back to the 14th Century and through time has become a collection of ethereally beautiful buildings filled with the most precious treasures. Additionally, it’s alive and in full swing. You can see monks and priests moving around the place. Of course UNESCO had to include this wonder in its World Heritage List. We are not religious but we have to admit that taking part in a real Russian orthodox mass was magical. Though the church is impressive at daytime, at night, with the lights on and candles everywhere, it’s something else. People were singing and we couldn’t help but feel the peaceful atmosphere. However, Sergiev Posad is more than just the monastery. We loved walking about its streets searching for wooden houses. Yes, I know, we are a bit obsessed with Russian wooden houses, but they are so pretty! The city is dominated by low rise housing so many corners provide great views over the monastery. Additionally, there are several interesting neoclassical buildings along Prospekt Krasnoy Armii. We stayed at Hotel Russkiy Dvorik, just across the church. The hotel is small, elegant and very classy. It all felt totally Russian, like being in a Nabokov book. The restaurant offers outstanding food, perfect to replenish your energy after a long day walking about. We would wake up and go downstairs for breakfast over the best views in town. As if that wasn’t enough we took a third class train to Rostov and spent a day there without any tourists in sight (except for a small group of old ladies). We had the whole city just for ourselves: the outstanding monastery, elegant wooden houses, tree lined alleys and a beautiful lake. The place just seemed unreal. Have I mentioned it before? We are in love with Russia! The city is one of the oldest in Russia (Veliky means grand in Russian), being at one point or the other a place for Vikings, Fins, Slavs, Mongols and Poles. Talk about diversity! In the center of town you will find the main square, flanked by the Assumption Cathedral. From there all the way to the lake, lies a collection of gorgeous buildings dating back to the 17th Century. In one of them we stopped for coffee and cake. Rostov Veliky is ideal for long peaceful walks. You can walk all about the old town and the city’s fields under huge trees. Autumn was just around the corner so we could see thousands of leaves changing colors. Another great walk is next to Lake Nero. Additionally, you can rent a small boat and paddle. Our Selivanov Hotel, set in an old building next to Lake Nero, exceeded our expectations. We got a top floor room from where we could see the parks. It was September and being Russia, a bit chilly. Thus, we had lunch in town but decided to have dinner at our hotel. The most bizarre Russian thing happened. Exhausted we were eating, when the waiter approached us. Apparently, you needed an elegant jacket to eat there! Initially we got angry and complained but then we couldn’t stop laughing at the whole thing. We went from Moscow to Sergiev Posad with a direct train. Trains depart from Yaroslavsky train station, very convenient to us since we were staying at the Moscow Hilton Leningradskaya. Though we took a local train, we didn’t mind stopping at almost every station since this gave a chance to interact with locals. Take note that there are no direct trains from Sergiev Posad to Rostov Veliky. Therefore we took a local train to Aleksandrov and then another one to Rostov. However, we did go on a direct train from Rostov to Moscow in under three hours. Tickets can be purchased at the Russian Railways official website. Once again, grab a window seat and prepare to see endless fields, trees, and wooden houses.